By Éric Tardif, whose work "The Nest" has been selected for the international exhibition Birds in Art 2012, at the Leigh Yawkey Woodson Art Museum in Wisconsin from September 8 to November 11, 2012. In all, 125 artists around the world have been selected, including three Canadian artists: Eric Tardif, Chris Bacon and Robert Bateman. 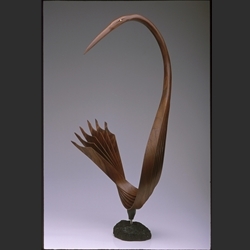 The Heron in Black Walnut is a custom order, hand made in bent wood. A waiting period of one month is usually needed for the artist to create a work closely resembling this image. Please inquire about pieces of a similar size that may currently be available. We will forward you photos of possible choices.